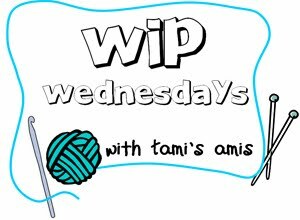 For todays wip post I’m checking in with Tami and Ginny. I was naughty this week and started not one but two new projects and didn’t really finish any wip’s, lol but I just couldn’t resist. Starting on the left we have some mini squares I’m crocheting up for a cushion cover, obviously I’ve a lot more to do but I’m enjoying this already. Above that is the start of a pink Milo vest for Lady Evelyn, after this one is done I need to do one for Princess Elizabeth and Lady Caoimhe, they have their colours picked out. Above the book is the Stormy Sky sock which needs the other half of the foot done along with the toe and then this pair of socks are finished. 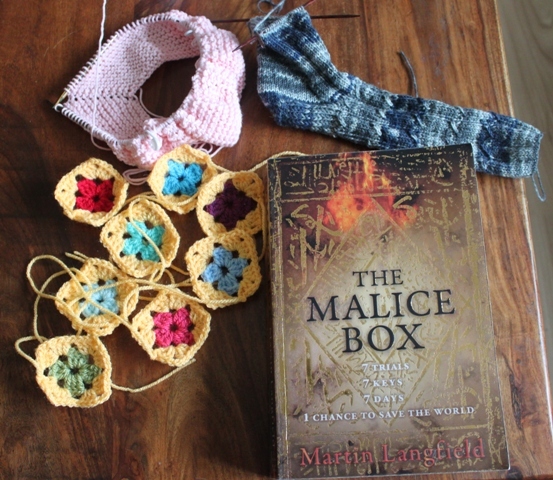 I’m currently reading The Malice Box by Martin Langfield and I’m enjoying this book very much at the moment and I didn’t think I would. I’m also listening to The Cloud Maker by Patrick Woodhead on audio. For other blogs taking part in the wip wednesday and yarn alongs check out the links at the top of the page. This entry was posted in Books, Crochet, Knitting, Work in progress and tagged Granny Squares, Milo Vest, Stormy Sky.. Bookmark the permalink. I look forward to seeing the completed Milo. I love mini squares, yours are so fresh and pretty. I can’t wait to see pictures of all the girls in their Milo knits…what fun! I so want to do a cushion cover too! You’re so funny in CO new projects but hey, whatever gets your fiber mojo goin’, yeah? I was trying to refrain from starting and for someone who on Sunday didn’t know what to do after present wip’s got finished I sure made my mind up quickly lol. Coming over from Yarn Along… the colorway on your socks is lovely. I keep wanting to learn how to make the little granny squares but am forcing myself to hold steady on what I have going.